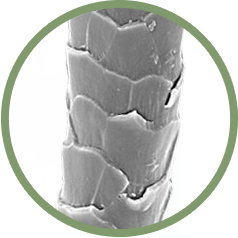 Smooth fibers do not offer structure nor resist each other when they are grouped together, thus, synthetics bottom out when weight is applied. Cannot support weight, nor distribute it away from pressure and tender points. Fiber breakage also occurs over time. Good insulators (i.e., Thinsulate™) by trapping quite a bit of area. Absorb less than 1% of moisture, so moisture from your body has to pass through your blankets and mattress or it will condense as perspiration. A mix of soft feathers, provides more support than synthetic, however still tends to bottom out and likewise cannot support weight nor distribute it away from pressure and tender points. With at least 85%+ mixture of feathers and plume, is also a good insulator. Down and feather fill have a tendancy to overheat. Although they provide a little more support than synthetic or down, the support does not last very long because fibers break and/or matte down. Here too, there is no support and distribution of body weight away from pressure and tender points. Breathes well and is preferred for some applications, but not as an insulator. Has a natural resilience that is a function of the natural crimps (or springiness) found in each wool fiber. These natural attributes create a weight supporting structure with the non-woven batting, like none of the others! Wool is as good as micro-fibers or down, plus has the added benefit of breath-ability, therefore wool can insulate and keep you warm to your exact body temperature, 98.6°F. By maintaining your exact body temperature, you will not overheat while you are sleeping. Safest choice as shown by its institutional use. Because of its unique chemical structure and natural moisture absorption, difficult to ignite. Wool suits are worn by race car drivers to protect them from fire. Wool fibers have a natural springy quality with a built-in memory. These springy fibers allow wool bedding products to return to their original fluffy, soft shape even after many compressions. Our ECO-Pure™ Wool brings sleep comfort to a new level by conforming to the individual contours of your body for enhanced comfort and rejuvenation. Which mattress type is the best for Me? Longest wool mattress lifespan on the market! Which topper thickness is the best for Me? 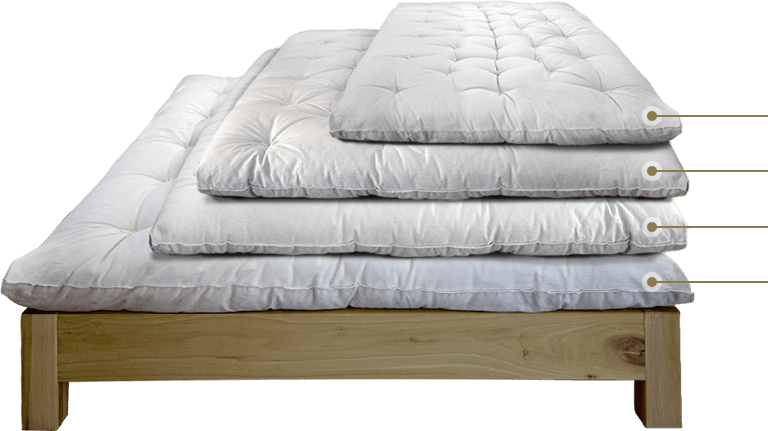 The economy mattress topper is 6 inches before tufting finishing at approximately 2 inches after tufting when new. The Standard model is 9" thick before hand tufting finishing to approximately 4 inches thick after tufting when new. The Ultimate model is approx 12 inches thick before hand tufting resulting in an approx. 6 inches thick topper after tufting when new. For customers who prefer a more supportive sleep we recommend our Economy™ Topper. This topper is approximately 2" thick finished and gives you a nice comfort layer that won't feel too soft. This is a great option for those who wish to feel the firmness and support of our Signature™ mattress. If you love how this sounds but want a little thicker of a topper, try our Standard™ topper. Not sure? Give us a call and we'll give you your own comfort consultation! For customers who prefer a plush, luxurious sleep we recommend our Ultimate™ Topper. This topper is approximately 6" thick finished and gives you the most comfortable, plush sleep that will have you feel like you're "sleeping in a cloud". Customers who suffer from severe ailments, prefer a soft sleep, or for customers with a larger figure would love this topper! The extra layers of batted wool add to the longevity of the Ultimate™ topper. If you love how this sounds but want a little less thick of a topper, try our Standard™ topper. Not sure? Give us a call and we’ll give you your own comfort consultation! custom size requests are welcome! Which comforter weight is the best for Me? ECO-PureTM Wool 100% natural properties has the added benefit of breathability to keep you cool during the hot summer months. ECO-PureTM Wool 100% natural properties is as good as micro-fibers or down, plus insulates to keep you warm to your exact body temperature. Which Pillow Fill is the best for Me? 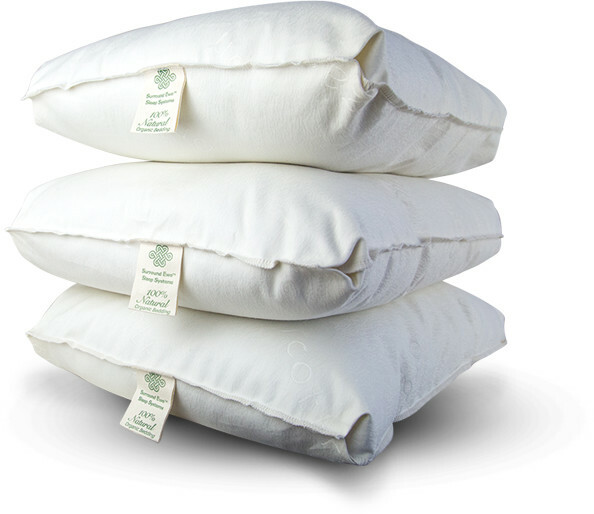 Our Hug Ewe™ soft fill pillows are a great option for tummy sleepers. The shallow depth of wool layers allow your neck to be correctly aligned for maximum comfort! Our Hug Ewe™ medium fill pillows are an ideal choice for combination sleepers and/or side sleepers. The in between depth of wool layers allow your neck to be correctly aligned for maximum comfort! Our Hug Ewe™ firm fill pillows are a nice option for back sleepers. The raised depth of wool layers allow your neck to be slightly raised up for a blissful night's sleep. Thinking about purchasing our Signature™ mattress, Premium™ mattress, or one of our Mattress toppers? Don’t forget to purchase our Washable Wool Protector Pads. They are made with a thin layer of felted wool and incased in the same organic cotton our other products are made with and is designed to naturally wick away moisture caused by body perspiration. Our washable wool protector pads are great because they protect the surface area of you wool sleep system without sacrificing the breathability of your other products. Every week, simply take your washable wool protector pad off your bed and throw it in your washing machine on cold, and tumble dry on delicate. It’s that easy! Twin beds are great for small children, teenagers, single sleepers, a snoring husband, for guest rooms or when space is limited. Full size mattresses are great for single or double sleepers, older children, the guest room and grandma's room. Queen mattresses are a great option for comfortable bed solution especially when one or more people (or a 4-legged friend) sleep by your side. With the ample room and added comfort a wool king mattress offers, your sleep will be the healthiest most luxurious experience…ever! Bedding Buyers Guide for Mattress, Topper, Sheets, Comforter and Pillows! When considering a new mattress, bed frame and bedding, The Wool Bed Company™ should be the first decision you make. When there are so many products and reviews on the market today, it's important you’re bedding products come from a reliable industry resource like The Wool Bed Company™ and not a mass producer. Deciding what type of sleep system you should buy let alone the size, is a complex decision. The Wool Bed Company™ is here to help. We have created a bedding buyer’s guide to assist you in making the best bedding decision both suitable for your lifestyle and health. Tips for buying your ECO-Pure™ Wool Mattress, Soothe Ewe™ Mattress Toppers, Snuggle Ewe™ Comforters, and the other natural wool bedding products. Protect your investment by buying mattress topper coverlet and comforter coverlets. The wool-filled Soothe Ewe™ Mattress Topper and Snuggle Ewe™ Comforter work best when as close to your skin as possible. Our coverlets of 100% organic cotton, remove easily for laundering. Measure your bed if in doubt about the right size Soothe Ewe™ Mattress Topper. There are several different sizes of king mattresses, so please measure if in doubt. If you don't see your size listed, please contact The Wool Bed Company™ to talk about customizing a mattress topper for your specific needs. We've made ECO-Pure™ Wool mattress toppers for hospital beds, travel trailer bunks and other unusually sized beds. Think about which Soothe Ewe™ Mattress Topper will best meet your needs. The wool filling works to reduce pain and muscle soreness by eliminating pressure points. This only happens if your body is completely suspended by the mattress topper, so the more you weigh, the thicker the mattress topper you'll need.  We offer wool mattress toppers in standard or ultimate weight for added comfort. The ultimate mattress topper is especially recommended for people who weigh 180-200lbs or more and those needing additional pain relief. Talk with your doctor about getting a prescription for a Soothe Ewe™ ECO-Pure™ Wool mattress topper if you've been diagnosed with fibromyalgia, chronic pain, TMJ or arthritis. Some insurance companies will cover the cost if a doctor deems them medically beneficial. Once you have your ECO-Pure™ Wool Sleep System in place be prepared for the best rest ever and follow these wool bedding tips to increase the life of your ECO-Pure™ Wool mattress, pillows and comforters. Which thickness of Soothe Ewe™ Wool Mattress Topper should I order? How can I be sure your products will fit my bed? What do I do if I don't see the size I need? What do I do if I get my order, and I'm not happy with it? Which thickness of Soothe Ewe Wool Mattress Topper should I order? The Ultimate Soothe Ewe™ Mattress Topper is our most popular style. The wool filling in the mattress topper works to reduce pain and muscle soreness by eliminating pressure points. This only happens if your body is completely suspended by the mattress topper, so the more you weigh or the more severe the pain, the thicker the mattress topper you'll need. We recommend the Ultimate Mattress Topper for people who need additional pain relief or who weigh more than 180 - 200 pounds. Our organic wool bedding products are all custom hand-made. We will make them in all standard sizes. There are several different sizes of king mattresses, so please measure if in doubt. Our product pages give specific dimensions. If you don't see your size listed, please contact us to talk about customizing a mattress topper for your specific needs. We've made mattress toppers for hospital beds, travel trailer bunks and other unusually sized beds.  Each wool bedding and organic cotton product is hand-made to your individual specifications. Most orders will arrive via Fed Ex within 14-21 days from placing your order. We want you to get a good night's sleep! That's why all our products come with a 30 - day guarantee (if the product has not been damaged or tampered with). Wool bedding provides an increase in comfort but does require specific care which differs from your standard mattress care. This care extends the life of your bedding but truly enhances your comfort year after year when ordinary mattresses just start to feel old! Learn from the experts what the best wool mattress and mattress topper care tips are now. Participate in our Wool Bedding Renewal Program to ensure an extended performance of your wool mattress or topper and pillows and comforters. We want you to sleep well. Sweet dreams!